With cybernetics these days, the first thing one needs to check is whether the person writing is still alive. Unfortunately, Klir died three days ago. Death is the biggest single constraint we know. Its effects in concentrating the mind are particularly powerful. So Klir's death coinciding with the beginning of my interest in this work is something which spurs me on in a strange sort of way... Perhaps at some point in the near future I'll be able to say something interesting about Klir. It is the nature of academic work that it gets passed on even after death. Ross Ashby was one of the pioneers of cybernetics. His Law of Requisite Variety (in a nutshell, a complex system which can exist in a number of possible states, n, can only be controlled by another system which can exist in at least the same number of states), has been the foundation of cybernetic practice. Ashby knew that his Law was basically the same as Shannon's Information theory, and from the 1950s onwards, much of Ashby's work explored the connection between his concept of Variety and Shannon's mathematics. He also knew that there wasn't much to it: "Information theory is basically counting; it is a branch of combinatorics" (Cybernetica, 1958, Vol 1, no. 2), but this kind of counting was exceptionally powerful. However, what distinguishes Ashby more than anything else was that he reflected deeply on what he was doing when he was doing cybernetic work. This led him to a remarkable, and I think quite distinctive, theory of science. I am currently spending some time examining Ashby's remarkable personal journals housed in the British Library, and which have recently been digitised (see http://www.rossashby.info/) in search of a more formal appreciation of his method. Fundamentally, Ashby is concerned with constraint. He says of cybernetic science that cyberneticians "observe what might have happened, but did not" (http://www.rossashby.info/images/aphorisms/wrasa001.jpg). His concept of science was that minds generate ideas through building models of the world. Knowledge arises as a result of the identification of error in the models as new constraints of nature bearing upon the speculated model are discovered. This idea of constraint is fundamentally different from the traditional causal paradigm of conventional science, which sees mechanistic descriptions of event regularities. The problem with mechanistic descriptions of causes is that it is easy for the science establishment to become complacent, because it believes its function is to identify and prove mechanisms (even if philosophers like Popper rightly point out that the job is to dispove things). This complacency has led to the kind of stultification of science that we have today where practically everything revolves around data processing, and critical inquiry has been pushed out in favour of commodified knowledge and capitalist-driven science ethic. Under such circumstances, Popperian falsification is a much harder ask than it ever was before marketisation. We become attached to mechanistic explanations out of desire to maintain social status or personal gain. We consequently lose sight of the constraints within which it emerges. This is particularly true of the woeful attempts to explain education and learning (which Ashby had a particular interest in). Capitalism is incompatible with science. If he were still alive, I think Popper would be changing his mind about the conservatism with which he was associated. To put the identification of constraint at the heart of a methodology is to negativise science. Most interestingly, it focuses not just on the constraints of nature in showing how a model is wrong, but it also considers the constraints which bear upon the creation of models in the first place. Cybernetic theory itself is subject to constraint - something which many cyberneticians (who wish their theories to be 'correct' because they appear sometimes in need of religion rather than science) forget. I've realised that categories I've explored before in identifying different tendencies in cybernetic theory - foundationalism, objectivism, universalism - all expose different kinds of constraint within cybernetic theory. Moreover these categories themselves are constrained - not least by each other. Ashby's later work looked at the dynamics of constraints and their interactions in a concept he called 'cylindrance'. This aspect of his work is little known, but for education, I think its obvious that learning occurs within a myriad of constraints - some of which are applied by the teacher - and that the interactive dynamics of those constraints colour the progress of learning. I recently wrote a paper about how, with work-based learners, the interaction between the constraints of work and the constraints of a course can combine to produce learner reflections about their work. Ashby presents a framework wherein this kind of analysis can become more systematic. For education, as for many other domains, that would be a promising step. Does the Knowledge Economy kill Knowledge? The 'knowledge economy' is one of the principal ideologies of our time. The idea that the contents of one's head is the determiner of both personal and societal success is not new. But what is new is the process of putting a price on it. And the idea of the knowledge economy is not about ideas themselves, but on the price of ideas. It is a moment in a process of financialisation. Financialisation works by identifying observable transactions in society - regularities of communication - which can have costs attached, companies created, and which can then be used as an institutional or corporate foundation for raising finance. Technologies have greatly assisted in the financialising process because they have taken large-scale social functions and carved them up into individual transactions supported by a kind of interconnecting logic. It is by this means that one might take the operation of a railway and identify common transactions with regard to the maintenance of the track, the scheduling of services, the selling of tickets and cups of coffee, and each pattern of transactions can then be identified with a separate financial entity, whose purpose is to make a profit, and each component become dependent on financial services to support its operation, and which eventually becomes driven by financial services in the manner of its operation. What happens in this process is that there are aspects to the original services which were not exposed in observable regularities of transactions. In the financialisation process, these hidden aspects of human engagement get left out. The result is social pathology where the functioning of the financial instruments becomes the paramount concern, blotting out insecurity, low wages, alienation, and the broader ecological and social impact of the financialised transformation. What is lost in the process of financialisation is knowledge. It is this fact which makes the knowledge economy so problematic. The knowledge economy is the financialisation of the transactions of education. It involves the transactions of patents, policies, academic publishers, league tables of universities, student finance, modules, learning outcomes, and vast arrays of statistics which claim to measure the 'performance' of institutions, subjects, individuals, and governments. The key question is How does knowledge relate to the transactions of education? What is the relationship between the contents of peoples' heads and the semantic contents of academic papers? Financialisation in education has produced a hunger for publication in education. This is become one of the principal means by which the status of academics and institutions is assessed. "Publish or perish" is produced by the financialisation of education. Consequently, the number of journals has increased, but the variety of papers has not increased. Coherent intellectual positions have been replaced with academics declaring numerous "turns": the ontological turn, the embodiment turn, the sociomaterial turn, and so on. Each hopes that their "turn" will be the one that everyone will follow. In short, everyone is trying to sell their ideas. Is this knowledge or madness? The internal dynamics of universities beholden to financialisation help to explain the 'turn phenomenon'. Fundamentally, all university managements have become the same. It's a process which DiMaggio and Powell call "institutional isomorphism", and the rest of us call "managerialism". If all university management is the same, why do we have so many universities? Do we need so much redundancy of management function? University managers understand the logic, and how the professionalisation of themselves ought to spell the end of most of them. So whilst there is institutional isomorphism at the top of institutions, each management must ensure that the productions of the university are distinct and diverse. This cannot be done in teaching: universities are generally the same in their pedagogic practices and methods of assessment. It might be done by their intake - some institutions are very exclusive, whilst other let anyone in - to the point that questions are asked about the value they provide. All institutions are able to declare the 'scarcity' of knowledge (and thus maintain the price of a degree) because they are the gatekeepers to degree certificates. But by maintaining distinction in the academic transactions of the institution, a claim can be made for the independent existence of a particular university above other institutions which do pretty much the same thing. So it is not the thoughts in individual minds that count - it is diverse production of measurable academic transactions. However, the constraints of the market bear upon all functions within the institution. Unpopular courses - like philosophy or sociology - get closed and academics lose their jobs. As a result, tranches of intellectual territory are lost. It's like cutting down swathes of the rain forest. To make up for this loss of richness, new subject areas emerge more consistent with the popular courses that students study. But these new disciplines do not possess the intellectual richness of those which they replaced. Dumbing-down is a symptom of attempting to maintain the appearance of diversity of discourse whilst destroying substantive chunks of knowledge on economic grounds. More than this, full-time academics find themselves under pressure because of relatively high salaries. The commodification of educational delivery mean that they are eventually replaced with adjunct teachers whose function is merely to follow the institutional teaching regulations, and who have no remit or power to think for themselves. So the knowledge economy leads to the destruction of knowledge. There is a deeper question here about the role of knowledge in any economy. The rhetoric of the knowledge economy sees universities as the hub of innovation. This is rarely the case. The most fundamental innovations which have changed our lives - particularly in technology - emerged outside the university, or at least on its fringes. Innovation emerges at the interface between critique, technological playfulness, and reflection on individual experience. It emerges through reading Goethe whilst playing with a quantum computer. The tragedy of the knowledge economy is that its ideology is leading to an environment where this can no longer take place. Most elections do not ask people to vote for an institution. Institutions are not borne out of democratic voting: they emerge through the exercise of social positions, rights, responsibilities and obligations in daily life. Voting is such an exercise - but we vote primarily to re-assert our right to throw our rulers out of office if we don't like them - even if we vote to preserve the status quo. What if we were having a referendum on the future of the BBC? Would any government call such a thing? I doubt it. The future of the BBC would be determined by government policy. If we didn't like the policy, we would resolve to throw the government out. This is really how our relationship with the EU should be handled. But for internal political troubles within the government, it has been forced to hold a referendum. What will the people do? I think it's obvious. They will re-assert their right to throw the leaders out of office (even if they like them) because that is what voting is really about. They will vote for Brexit. If there's one thing that the EU vote, the selection of Donald Trump to run for president, the election of Jeremy Corbyn, or the appeal of Bernie Sanders have in common is that they all have arisen by people asserting their democratic right to kick people they don't like. If there's a critical mistake the establishment has made it is that they have forgotten what voting is. It is not a statistical game like the X-factor that (in the end) maintains the centre ground and upholds the existing institutions of government. People vote to assert their right to vote and it is because that right is upheld by the institutions of government that its very unusual for anything more radical than a minor change of leadership ever results. The EU was never democratic in this way. In EU elections, people voted to assert a right to send a signal to their national government, not to elect a European Parliament: they didn't need another parliament because their right to determine their future was adequately upheld by their national government. European democracy was fake democracy, and European voting was a distortion of voting. Moreover, fake democracy is usually some kind of cover for doing something against the interests of the people, but claiming that the people have just voted for it. Perhaps all referenda are 'fake democracy' like this: a way of slipping-in undemocratic manoeuvres all the time claiming a mandate for doing so. They protect the government of the day from taking the full consequences of the serious decisions they are elected to take. We start wars without referenda, and governments bear the consequences. Why have a referendum to leave the EU if not to stop the Tory party tear itself apart? The interesting thing about this vote is that although it is 'fake democracy', its consequences will destabilise Europe: not least, because it will call the bluff of the establishment who believed the exercise of democracy was there to support the institutions which they created. True democratic institutions do not come into being like this. I've had a busy week running a conference on Emotion and Embodiment at my University. It was great fun - although to be honest I'm not sure we're any the wiser about emotion and embodiment (but I'd guessed that would be the case). Tony Lawson's contribution at the end pinpointed the central difficulty: fundamentally, the raising of issues of embodiment and emotion were a response to the deficiency of an academic discourse dominated by post-structuralism. Post-stucturalism, he argues (I think) is simply wrong, and its wrongness leads to discursive developments which only add to intellectual confusion. I'm sympathetic to this. Similar arguments can be made for the current popular obsession with sociomateriality in educational research. The alternative - realism - by its nature orients itself around real embodied existence. My only quibble here is that I think we cannot know whether what is real is cause or constraint - and it makes a difference which we settle on. Lawson focuses on causation and mechanisms. I am interested in self-organisation and constraint. At some level, they amount to the same thing - but there is an inherent undecidability about which it is which many less thoughtful realists fail to acknowledge. Undecidability has been a bit of a theme this week as I've found myself playing which IBM's fascinating Quantum Experience (http://www.quantumlevitation.com/en/ - thanks to @iantindal for the tip-off). IBM's interface features a music-like score to logically handle the uncertainty of the combination of states of QBITs. I think the metaphor is appropriate: a written note in a musical score does not determine how it will actually sound, but the overall effect is achieved in its combination with other notes in the mind of a performer. The "program" is the ensemble. At the conference, one of the most interesting presentations concerned the 'Aesthetics of institutional life' and the possibility that there was some kind of 'rhythm' or even a "music" of institutional life. I like this, although it demands we are very careful in saying what we think an institution is: there is a tendency to reify institutions when they are essentially emergent. But a music of institutions? Yes, I suspect this is right. What does it mean? Music is powerful partly because we have some access to its components, their interactions and its processes of growth. In institutional life, all we really have access to are the transactions of the institution - whether they are transactions of daily institutional life, or the transactions between the researcher and institutional stakeholders. Although the transactional perspective appears limiting, it can be a useful lens through which to view music. The musical score is the transaction of the composer, the guitarist's 'lick' is a transaction in emergent performance, the rehearsal schedule is a transaction in the group organisation, the motif is a transaction in the construction of a form, the attenuation of tempo or dynamics by a performer is a transaction in the control of a collective expression. It's just that we can't see these very clearly. My experiments with Sonic Pi (see last post) are making me think much more clearly about how creative emergent acts can be conceived and captured transactionally. In Sonic Pi, those acts are pieces of code. But it is not just the generation of pieces of code and the sound that emerges, it is the sharing and copying and transformation of ideas. This can all be studied. So then, what if we look at the institution's transactions from the same perspective? What if we took a subset of institutional transactions? For example, what if we concentrated on the transactions that teachers and learners make in an educational institution? Seen from this perspective, Learning Analytics is not a way of bettering teaching and learning (whatever that might mean). It might, however, be an opportunity to explore the music of institutional life. A lot of my computing work is taking place on Raspberry Pi at the moment. On the one hand, it allows me to write some pretty advanced routines for manipulating data and web pages (I'm doing some web automation using Selenium at work at the moment) and I know that once I have got things to work, all I have to do is plug the thing in and away it goes. I'm not messing around with cloud servers or anything that gives lots of setup headaches - what would once have seemed a bit wasteful to dedicate a whole machine to now doesn't matter - I just plug in a pi and the job's done! But there's no question that what's REALLY cool about the Pi is Sonic Pi. I've made a weird kind of music box. 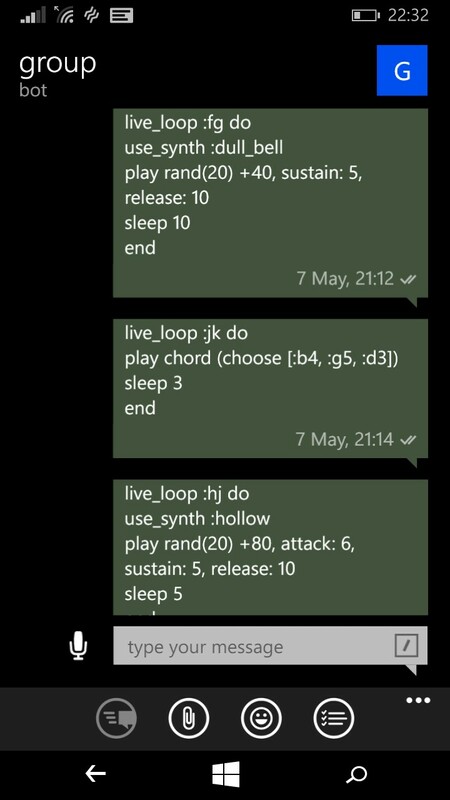 Basically, taking my cue from Nick Johnstone's blog and Robin Newman's work with Telegram (see http://widdersh.in/controlling-sonic-pi-from-vim-or-anywhere-else/), I've installed the Telegram CLI client, and have hacked around with the code so that I can send Sonic Pi code from my Mobile phone to the Pi. It works! 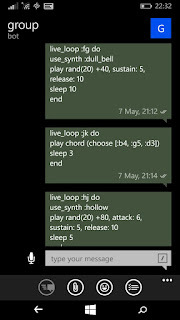 Not only can I control it from my mobile, but I can make music with others, because their messages can get processed too. At a deeper level, I'm interested in this because, apart from being a kind of collaborative live coding, it highlights the fact that every single message from Telegram to the Pi is a kind of transaction. Done collaboratively, different people's transactions are made visible to each other. Each person may repeat someone else's transaction, or change it in various ways. Thus what emerges (I haven't implemented this yet) is a kind of structure of the live coding co-creation: we should be able to see the emergence of musical ideas which are picked up by others, modified, repeated and so on. As the music progresses I find myself reviewing the transactions I have already tried, and selecting ones which I think might be interesting. It's all quite exciting... the Pi Orchestra is next I think! The result is a kind of combination of polemic and analytical systems thinking which is similar in spirit (although a bit more technical) to the work of Illich or Freire. In some ways Morin is less radical than Illich: there are no calls for 'deschooling' here: Morin appears to see education as a real thing in society which has a misconceived function. Morin's question concerns what education does and how it thinks about itself. Morin attacks disciplinary reductionism, arguing that education should concern itself with creating a context for exploring the human condition. He doesn't say very much about technology or institutions, which is perhaps an indication of where he draws boundaries around education. Information theory and its cybernetic underpinning is at the heart of Morin's thinking. When he says that "Education's function is to transmit knowledge" there is perhaps an unfortunate connotation that might be drawn with naive didactic theories of education. This might stop people engaging more deeply with the book. It shouldn't. Information theory is not about 'transmission' in the sense that is popularly understood (as a kind of 'contagion'). Information theory is about relations, and fundamentally Morin articulates a powerful relational account of education. Most importantly, Morin puts emphasis on the importance of uncertainty: "all our knowledge is fallible". The word 'uncertainty' has both a popular connotation and a technical meaning. In Shannon's information theory, uncertainty is the index of information: a reduction in uncertainty is both an indicator of information transmission, and coordination of action. To talk of transmission of knowledge is to talk about increasing the capacity of society to coordinate it's diversity and viability. Uncertainty, from a cybernetic perspective, also has methodological implications. Morin doesn't say it explicitly, but the reductionism of knowledge which afflicts education results from the embrace of causation as the principal explanatory category of science. (If we'd listened a bit more carefully to David Hume in the 18th century, perhaps we wouldn't have made this mistake) When Morin says that knowledge is 'fallible' he means that our explanations of causal connections are constrained by what we don't know. The coordination of human action depends on understanding the constraints of knowledge and action - and these are indicated by our uncertainties, not our certainties. Yet education works by reinforcing certainties because this is seen by institutions as the best way they can maintain their viability. Morin's educational vision is ecological: the human being is at once an individual, a member of society, and a member of the species. He doesn't however, specify is a pedagogy. What he has done is to very clearly state some fundamental principles which could be knocked into the ground like airport runway landing lights. I think it's as if we've been flying around aimlessly in education for years, and now we're running out of fuel. Morin has lit up the landing strip. Now we have to work out how to get back down to earth safely. One of the criticisms of current data obsessions is the way in which analytic results appear to 'shout science': in other words, to make a claim for objectivity from collective subjectivities. Science is held to be domain of objectivity - of denotative claims: the realm where one points at something and says 'it's clearly moving at speed x, with momentum y" and so on. The subjective world is a world of connotation and interpretation: meaning arises between things. 'Shouting science' makes denotatative claims about connotative processes. In the final analysis, this is an act of oppression: it can only impose an 'objective' judgement on those whose connotative processes might not only come to a different conclusion, but almost certainly come to a different conclusion in the additional light of the imposition of analytic claims to truth. What's wrong here is not data analytics itself. It is our view of science which is mistaken. To put it quite simply, 'objective' judgements are not indicative of stable entities in the world to which labels can be attached. They are indicative of coherences of understanding and expectation around which action can be coordinated. Zebras have no word of 'lion', but there is a coherence of expectation among zebras that coordinates action when a lion is spotted. We see the effects of these coherences in the regularities of behaviour which occur around particular entities: lifeworld entities like 'lions' exhibit a universal constraint on behaviour rendering it surprisingly predictable. The question, with regard to data, is whether there is some indicative index of this coherence of understanding. But the same logic applies. Such an indicative index, were one to be available, is itself indicative of coherences of understanding and expectation around which action can be coordinated. However, when things get more abstract, deeper problems set in. A declaration of an index by a powerful person can create a coordination of behaviour driven by understanding and expectations about the constraints of power dynamics, not the index itself. This is where false consciousness begins - and misleading representations of science. Understanding is built up from the accretions of references. So too might we build up an understanding of learners through accretions of representations of what they do. The Facebook analytical graph is one of many possible descriptions of interactions online. It may be that such representations are important because so few alternative descriptions of online behaviour are available. In face-to-face communication we have bodies, sounds, movements, smells, touch and so on. Each contributes a layer of the connotative experience. Is it a wonder that online we feel the need to create this diversity of description? But then if we do this, and we assert it as denotative, a distortion occurs. But we only do this because we think this is what science does. The scientific question concerns the generative power of the imagination and the discovery of constraints that nature imposes on imagined mechanisms. Codified mechanisms are coordinators of discursive processes. That might be the beginning of organised attempts to find those mechanisms in nature: The Hadron Supercollider is a good example. When some mechanisms are not found, the natural constraints which prevent them can also be coordinated. It's not finding the Higgs Boson which is important; it is identifying those speculated mechanisms which cannot be found. Our research approach to education would look very different if we applied this approach. We would identify the constraints within which theoretical constructs are upheld, and where they don't work. Most importantly for the data analysts, the appreciation of constraints requires the accretion of many different descriptions. It is in exercising a connotative judgement that understandings between us can be coordinated. In a deep way, science IS education.